After its extensive brand relaunch MINI is showing up for a broad audience for the very first time, at Paris Motor Show. There, the new MINI John Cooper Works Clubman shows up for the very first time – as a world premiere. The selection of John Cooper Works models is now extended. After the successful launch of the new MINI John Cooper Works with the classic three-door body shape and the new MINI John Cooper Works Convertible for highly turbulent open-air driving fun, the new MINI John Cooper Works Clubman is now presented as an all-round talent able to handle the wide-ranging demands of day-to-day traffic as well as the challenges of race track driving. Fitted with the most powerful engine ever in a MINI, the standard all-wheel drive system ALL4, a suspension technology geared towards the very highest performance qualities as well as exclusive design features and fittings, it is clearly distinguished from the other model variants of the new MINI Clubman. The drive torque is generated by a 2.0-litre 4-cylinder engine with MINI TwinPower Turbo Technology and model-specific modifications derived from motor racing. With a peak output of 170 kW/231 hp and a maximum torque of 350 Newton metres, this engine accelerates the new MINI John Cooper Works Clubman from zero to 100 km/h in 6.3 seconds, with both the standard 6-speed manual transmission and the optional 8-speed Steptronic sports transmission. The suspension with Brembo sports brake system and 18-inch John Cooper Works light alloy wheels is ideally geared to the performance characteristics of the engine. Aerodynamically optimised body features likewise contribute to the car’s permanently controllable handling properties. The standard trim of the new MINI John Cooper Works Clubman comprises not just the cockpit in model-specific design but also LED headlamps, the MINI Driving Modes, Park Distance Control, Comfort Access including touchless opening of the split doors, the Radio MINI Visual Boost with 6.5-inch colour screen, multifunction buttons on the steering wheel and cruise control with brake function. In addition to this, the current MINI model range for the small car segment will also be presented to trade fair visitors in the French capital. Alongside the new MINI Convertible, it is the new MINI Seven that particularly takes centre stage. The first design model of the new generation is available both as a MINI 3 door and a MINI 5 door. 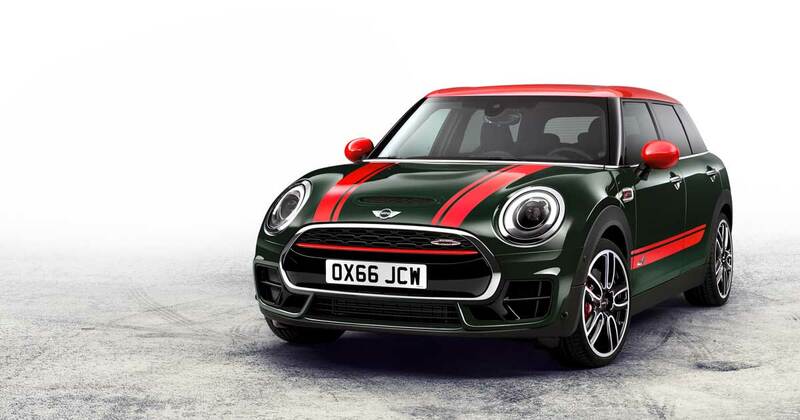 This design model particularly highlights the British origins, extrovert appeal, hallmark driving fun and premium character of the new MINI generation. The contrasting paint finish for the roof and exterior mirror caps in the variant Melting Silver, exclusive bonnet stripes and deco elements as well as 17-inch light alloy wheels in MINI Seven two-tone design underscore the model’s individual style on the exterior. Exclusive accentuations in the interior especially include sports seats in the fabric/leather combination Diamond Malt Brown, created especially for the design model. There are two petrol engines and two diesel engines to choose from for both body variants of the new MINI Seven. What is more, the equipment package MINI Seven Chili is offered for selective enhancement of comfort, riding fun and personal style. The naming of the new design model recalls the premiere of the revolutionary British small car more than five and a half decades ago. The first specimen of the 4-seater known today as the classic Mini came off the production line as the Austin Seven. The Paris Motor Show will take place at the Paris Expo from 1 – 16 October 2016; press days will be on 29th and 30th of September. Expect the BMW MOTOR SHOW BLOG to bring you lots of news and photos live from the floors at the Porte de Versailles.